Hummingbirds are like tiny combat jets dive bombing each other when staking claim to the nectar-rich flowers they need for survival. Fights over nectar habitat sometimes reduce hummingbird gardens to single occupancy. Turning your backyard into a slalom course of nectar feeders hanging from branches and shepherd hooks is an awkward solution to accommodate a village of hungry hummers. It’s better to accompany a few feeders with an abundance of tubular flowers rich in nectar. At Flowers by the Sea Farm and Online Nursery, we raise many kinds of hummingbird plants. This article focuses on a half dozen indispensable choices that bloom bountifully as annuals nationwide and do well as perennials in some areas. All have great backstories about plant exploration. Plus, all are easy to grow. Due to the fierce behavior of hummingbirds, they became one of two bird symbols for the ancient Aztec god of war Huitzilopochtli (“Whee-zee-luh-poach-lee”). The other was the eagle. So, as pretty as hummingbirds are (the Aztecs also visualized their sun god as a hummingbird), they’re also formidable. Warriors (both males and females) need lots of nectar. Some hummingbirds are year-round residents in parts of the nation where winters generally are mild, such as along the California coast and in Louisiana. For example, there are always Anna’s Hummingbirds battling over blossoms on our Mendocino Coast farm where something is always in bloom. Yet nectar availability is primarily important from spring through fall in most wildlife gardens. In spring, many kinds of hummingbirds migrate north from the subtropics and tropics to mate in North America. They return south to their winter nesting areas from late summer through fall. 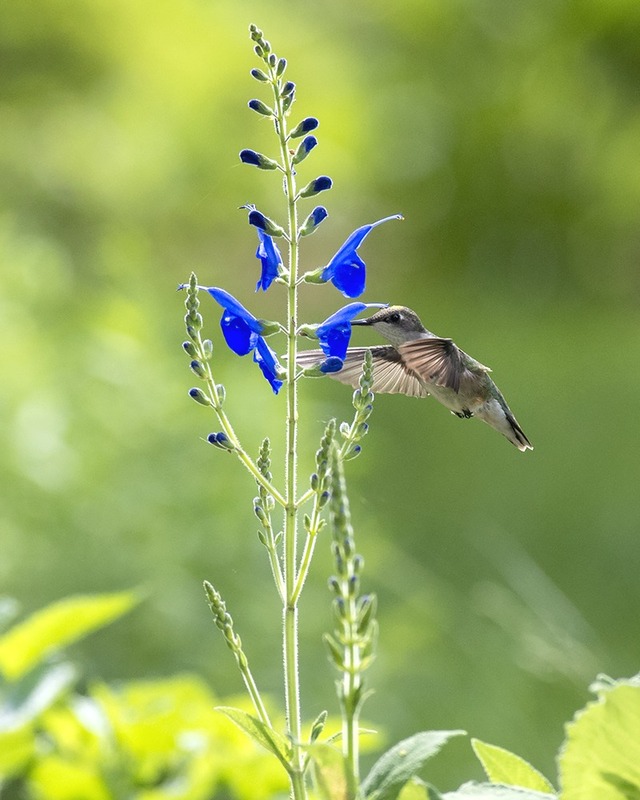 At FBTS, we observe hummingbird behavior year round and listen closely to what our customers say about the flowers that get the most buzz in their gardens. The plant descriptions in our online catalog reflect that information. Rich soil (garden loam containing compost and fertilizer). The Cuphea genus contains 260 species and is mainly native to subtropical and tropical areas of the Americas. Regardless of their home climates, Cupheas generally thrive in temperate areas. David Verity Cigar Plant is said to be a hybrid of C. ignea (Cigar Plant) and C. micropetala (Candy Corn Plant). Although both were introduced to horticulture before the mid-1800s, it can take a long time for some plants to find their market. In the 1960s, U.S. Department of Agriculture researchers began focusing on growing various types of Cuphea for their seed oils. The USDA wanted to decrease American dependence on imported oils and petrochemicals used industrially, such as in personal care products including soaps. Decades later, the USDA discovered that growing Cuphea in rotation with wheat and corn improves the protein content and seedling survival of those grains. Now, many Cupheas are finally gaining ground in home gardens due to hummingbird appeal as well as the bright colors and whimsy of their flowers (some look like tiny cigars; others have petals shaped like mouse ears). One of the best-known Cigar Plants is Cuphea x ‘David Verity’, which grows well in containers as well as in ground. It’s named for a California native of the human sort — horticulturist and plant developer David S. Verity (1930 -), former manager of the UCLA Mildred Mathias Botanic Garden. Giant Brazilian Sage tolerates heat, but planting it in a location offering morning sun and afternoon shade may be best if you live where summer heat is intense. It grows well in a container although potting decreases plant height. Placing the container atop a wheeled platform allows you to move it around for greater sun or shade. Botanically, sub means “sort of” and rotunda stands for “round.” So, in 1833, French naturalist Auguste de Saint-Hilaire (1779-1853) probably was thinking of the Giant Brazilian Sage’s sort of round leaves (we see them as sort of heart-shaped) when he named it. It’s probable that Saint-Hilaire collected S. subrotunda during a six-year plant expedition to Brazil beginning in 1816. The magazine Pequisa FAPESP, published by the Sao Paolo Research Foundation, notes that Saint-Hilaire collected “2,000 species of birds, 16,000 insects, 120 mammals, 35 reptiles and 76,000 plants” during that time. Although trained to be an accountant, Saint-Hilaire abandoned that career in favor of his childhood fascination with the natural world. British-born engineer, metallurgist, and industrialist George Boole Hinton (1882-1943) adopted Mexico as his homeland in 1911. As Hinton’s biography at JSTOR notes, “botany took over his life” when the Great Depression hit him hard. In 1932, he found Salvia dichlamys somewhere in or around the village of Temascaltepec in Estado de Mexico (State of Mexico), which borders Mexico City. By 1936, Hinton was a full-time plant collector sending specimens to taxonomists – scientists who identify, describe, and name plants — at many institutions. He sent S. dichlamys to Carl Epling at the University of California, Berkeley, where Hinton once studied. We don’t know what Epling meant by dichlamys when he assigned the plant’s botanical name in 1939. But di means “double” and chlamys is Greek for “cloak.” Perhaps he was describing the flower’s divided bottom lip, which has a cloak-like shape. Understanding the common name is easier, because the blossoms are jaunty and bright scarlet like a rooster’s comb. As to the Super Elk part of its scientific name, “Elk” signifies development of this particular cultivar by our plant breeding program at FBTS. “Super” tells you our opinion of the plant, because it exceeds the typical Rooster Sage for strength, rapid growth, and earlier bloom. Although “Elk” isn’t included in its name, we developed this variety of Anise Scented Sage in the FBTS plant breeding program. Compared to two other popular purple varieties — Jean’s Purple Passion and Purple Majesty — this one blooms earlier and more abundantly. It also has a tidier, more compact form. Furthermore, it is more cold tolerant. A number of Zone 6 gardeners have reported perennial success after winter mulching it. Anise Scented Sages put the lie to the idea that hummingbirds are only interested in hot reds and oranges. Their purple and violet-blue flowers have a solid reputation as a favorite nectar source. Native to several South American countries including Brazil, Salvia guaranitica is popular worldwide in all its many forms. Remember Saint-Hilaire from the Giant Brazilian Sage profile? He is also credited with collecting S. guaranitica in Brazil sometime between 1816 and 1821. It’s likely that he found it in Brazil’s Misiones Province on the edge of northeastern Argentina where he would have encountered the indigenous Guarani people. The species name guaranitica means “of the Guarani.” Here’s an article from our Everything Salvias Blog offering more information about the Anise Scented Sage Group. Most Anise Scented Sages have soft, herbaceous stems that aren’t as strong in windy conditions as this semi-woody hybrid that also blooms longer than Salvia guaranitica ‘Black & Blue’. Similar to that popular standby, BODACIOUS® has deep violet-blue flowers, dark stems, and black calyxes. BODACIOUS® is an FBTS hybrid that our international representative, PlantHaven, Inc., introduced in 2017 and markets in Europe as well as the U.S. Florida’s Costa Farms featured BODACIOUS® during its spring 2018 field trials. By the way, similar to Gentian Sages (S. patens), Anise Scented Sages have tuberous roots that can be saved at the end of the growing season in cold winter areas. In a 2009 blog post, horticulturist Joseph Tychonievich suggested wrapping the tubers in newspaper and placing them in a “loosely closed” plastic bag to store in a cool part of your house. In all its many varieties, Scarlet Sage (S. splendens) offers vivid color and long bloom throughout the growing season. We’d call the species a workhorse in the annual flowerbed, but that seems wrong based on the delicate look of its flowers. European royalty popularized the species after its discovery in Brazil by German botanist Friedrich Sellow (1789-1831) sometime before the plant’s introduction to horticulture in 1822. Sellow had joined a Russian plant expedition to Brazil in 1814 partly to avoid political turmoil in Europe. More history and a long list of the Scarlet Sages we grow at FBTS is available in our blog article Bedding Plant Royalty: Splendid Salvia Splendens. In addition to answering any questions you may have about plants in our online catalog, we’re glad to share what we know about gardening to feed pollinators and encourage beneficial insects. Please contact us and take a look at our long list of hummingbird plants. We’re buzzing with information. Now, on with our six indispensable hummingbird flowers.